Your face and its needs might vary widely from mine, and it's up to you to do a little thinking about what your goals are with your face. What is your skin type? How much coverage do you want (meaning, how sheer or opaque do you want your makeup to be)? What features do you want to emphasize or disguise? I'm using "foundation" as a catch-all term for makeup that is skin-colored and helps to even out your complexion, because in truth, this particular category is quite varied. This is really where it's important to know what your needs and goals are. What's your skin type? Make sure you pick a formula that works for you. For example, if you have oily skin, you don't want to pick something that will make you even more oily. What kind of coverage do you want? If you have a generally clear and even complexion, you might not need much coverage - just a little color to smooth things over. If you have lots of dark spots, acne scars, redness, etc, that you want to cover up, then maybe you will want something full coverage. What's your product preference? Foundations come in powder, liquid, and cream. What would be easier for you to use? 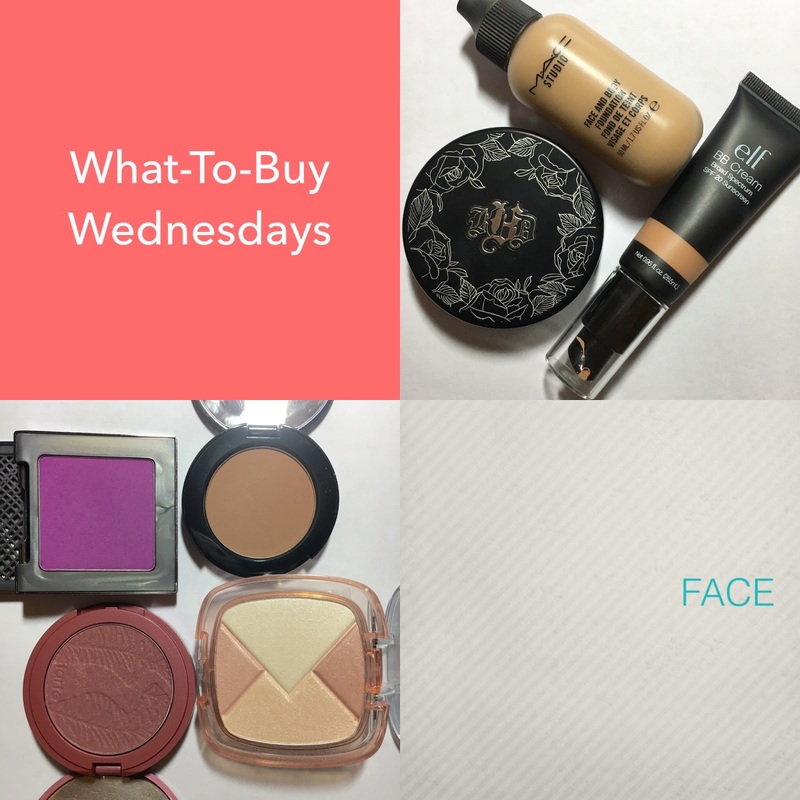 Do you want more natural makeup (as in, mineral/organic/toxin-free)? Do you want something easy to take with you for touch-ups? Do you need it to last all day in intense conditions (sweating/humidity/biting cold/etc.)? Tinted moisturizer - if you are generally free of skin concerns and especially if you don't want to fuss with a lot of products, then this is a good, quick, one-and-done product. It's generally sheer coverage, and you can just apply with your hands. BB Cream - "BB" stands for "Beauty Balm," and basically BB creams are supposed to be (according to Wikipedia) "an all-in-one facial cosmetic product to replace serum, moisturizer, primer, foundation and sunblock," though not all BB creams succeed equally. Some BB creams are as thin and sheer as tinted moisturizers, while some give foundation-like coverage. Liquid foundation - As it sounds. Liquid in consistency, and needs to be blended out, preferably with a brush or sponge. These come in all range of finishes and coverage. Some containers are not easily portable. 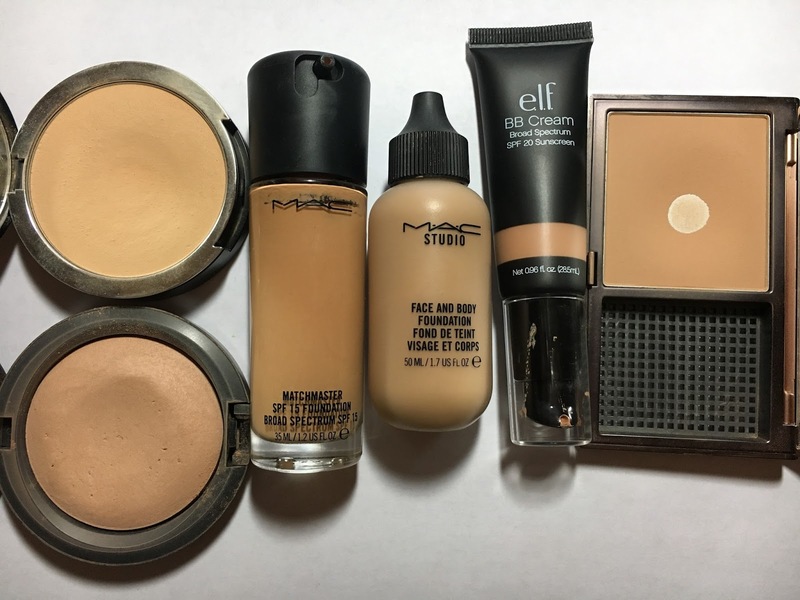 Cream foundation - I primarily see these either in compact form or stick form. Pros: Tidy, portable. Cons: texture may feel heavy. Powder foundation - Comes either pressed into a compact or loose. Powder foundation is different from setting powder, by the way - it has more pigment. 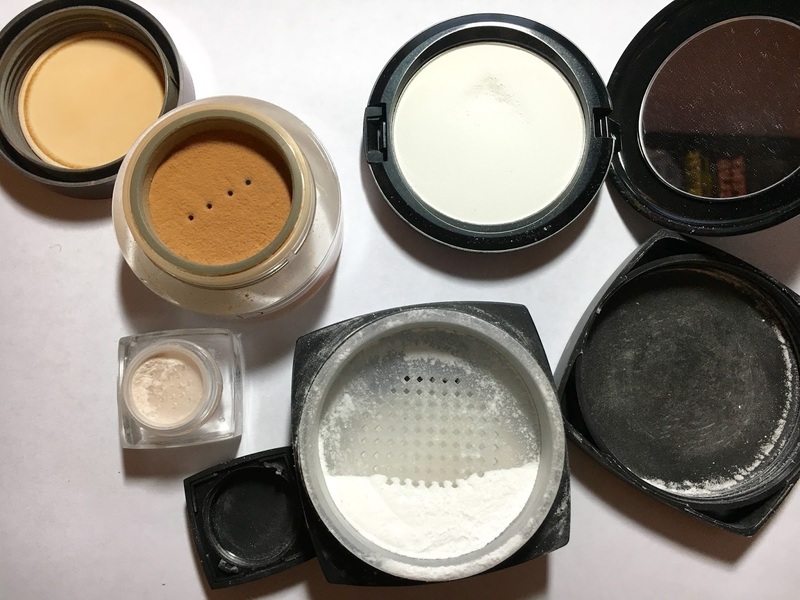 It's easier to layer more powder for coverage than to layer more liquid/cream; however, it's easier to look cakey if you're layering more powder. 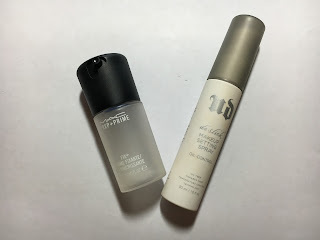 You'll notice that I didn't list "foundation primer" - while I think these are a REALLY REALLY good idea, you won't need one if, say, you're using a tinted moisturizer or a BB cream, or if your moisturizer happens to have primer in it (like mine does). I do HIGHLY recommend getting a primer though. 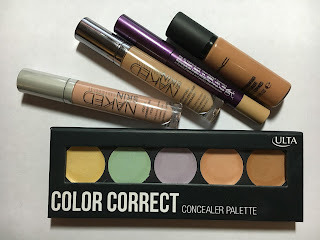 When it comes to foundation and concealer, my personal preference is to buy high-end, and it's not so much about the product itself, but the actual shopping part: it is vitally important to find the right shade to match your skin, and drugstores generally do not have testers. And if you're buying from a store that does not allow you to return opened/used products, then you're stuck with it. (I mean, let's say it takes you two weeks to find out that your new foundation makes you break out. What then?) Department stores and beauty retailers will often take things back within 30 days, even if you've been using it. That's my main reason why. It's not that drugstore brands are inferior - I'm paying that extra because I want to KNOW that I've got the right shade, and I also want to know that I can bring it back. Tip: Test out foundation along your jawline. You need to see how it looks against your face as well as your neck, because you kinda don't want your face to be a different color from your neck. I have no cream foundations to recommend, sorry :( I just don't gravitate towards them. Again, note that I don't really shop for foundations at drugstores. But I have heard many bloggers rave about Revlon ColorStay and Maybelline FitMe, for starters. For a loose color reference, check out my Living GLAM tab above for a list of all the foundations/concealers I've ever been matched for and in what shade. As with foundation, choosing a concealer will depend heavily upon your needs as well - what are you covering up, and how much coverage do you need? You do not, for example, want to use skin-clearing concealer (which may contain salicylic acid) to cover up undereye circles. Concealers come in as many forms as foundation does - liquid, cream, powder - and it's up to you which kind you choose. Unless you're using an actual powder foundation/concealer, you're going to want a setting powder. It does exactly what it says - it sets your makeup - which helps it last longer and helps take away shine. Some setting powders are mattifiers, some promise an "HD finish." They're either pressed in a compact (which is easy to take with you) or loose (which is messy, but easier to pick up product and dust on your face). Could you use your powder foundation as a setting powder? Yes, if you really wanted to, but remember that powder foundations contain a lot of pigment. I will use mine to set my concealer if needed, but I wouldn't set my foundation with it unless I wanted REALLY opaque coverage. All of the above products serve to even out your skin, giving you a blank canvas, as it were. But, it can look strange to be all the same color. So let's add some dimension and life back to your face. I've grouped these together because these days, you can actually buy yourself an all-in-one palette with all of them in it! If you're brand-new to makeup, then this is what I recommend. Usually these palettes are sold according to skin tone (light/medium/dark), and they include versatile shades (like, it won't be a crazy blush color, but one you can wear for any occasion). Individually, all of these generally come in powder or cream form. These mimic the naturally-flattering flush of your face. I know, it seems counter-productive to use products to cover up something that naturally occurs that is flattering, and then use another product to mimic it, but keep in mind that people cover up their natural skin for a reason. 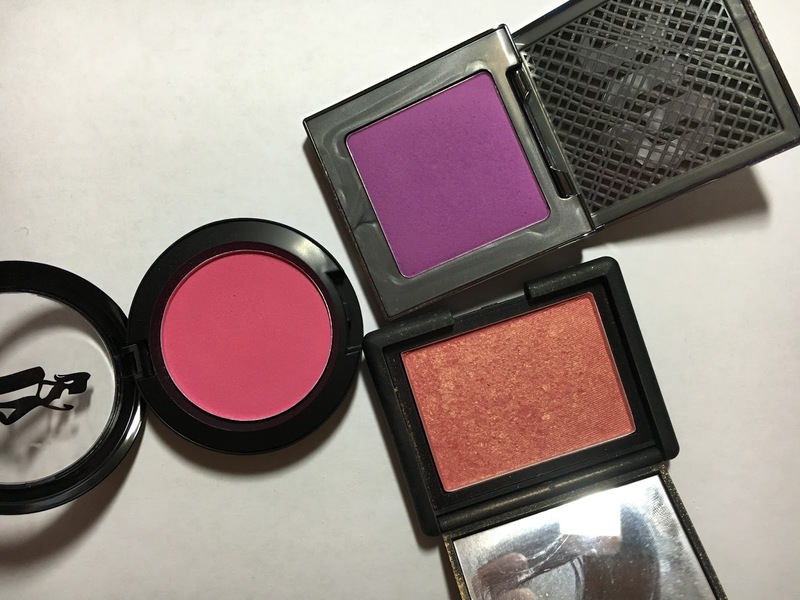 At any rate - blushes come in all number of shades, from orangey to purple, and personally, I choose which color depending on what my overall look is that day. I generally stick to something peachy-pink, but sometimes a candy-pink goes better with my eye look and outfit; other times, a plum blush works better. BASIC RULE OF MAKEUP: you use light/shimmer on features you want to stand out, and you use dark/matte on things you want to recede. Highlighting and contouring has become really popular in recent years because it's a way to play with the way light hits your face and the way shadows are created by your features. Contour shades, in my personal opinion, should be matte, because shimmery makeup is made to catch the light, and if you're creating shadows, you don't want light. People use contouring primarily to emphasize cheekbones, to slim down their jawlines, and to narrow down their noses. Highlighting makes features catch the light and stand out - you want to apply highlight especially on the areas of your face where sunlight would hit. I tend to prefer a matte highlight as well, just because sometimes shimmery highlighters catch a little TOO much light and they make me look sweaty. But on a special occasion? Heck yeah, bring on the shimmer! You could totally get away with using eyeshadow for any of these, but be sure to use a light hand - eyeshadows were meant to be more pigmented than face color. Kat Von D Shade & Light Contour Palette - all mattes! Urban Decay Gwen Stefani Blush Palette - This is a great all-in-one for my skin tone. The bronzer is matte and actually works as a warm-ish contour shade for me. 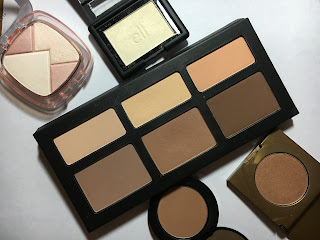 I have heard that the latest highlight/blush/contour palettes at the drugstore (as of the date of this posting) are quite good (from L'Oreal, Rimmel, Maybelline, etc.) NYX always makes good stuff too. I just can't personally vouch because I haven't tried them. I guess some people wouldn't consider this a must-have, but I absolutely do. If you're going to spend all that time putting on your face, you want it to stay. There are a lot more setting sprays on the market now, and some of them even tailored to the finish you want. Just mist it on, and done. Urban Decay De-Slick Oil Control Makeup Setting Spray - I've got combo/oily skin, and it helps keep me from getting too shiny in my t-zones. It also helps my makeup stay on, for the most part. As long as I'm not touching my face too much, there will still be makeup on my face after twelve hours, even. They make sprays in other finishes, but this is my personal fave. Tip: Both of the above sprays come in travel sizes (those are what I have in the photo, actually), which still last a loooooong time. If you're not ready to shell out for a full-size bottle, then I recommend doing that. No matter how great your products are, if you don't have good tools to apply them with, you're not getting the biggest bang for your buck. Fortunately, great tools are available in abundance at different price points! You don't have to spend hundreds of dollars to build a basic brush kit. 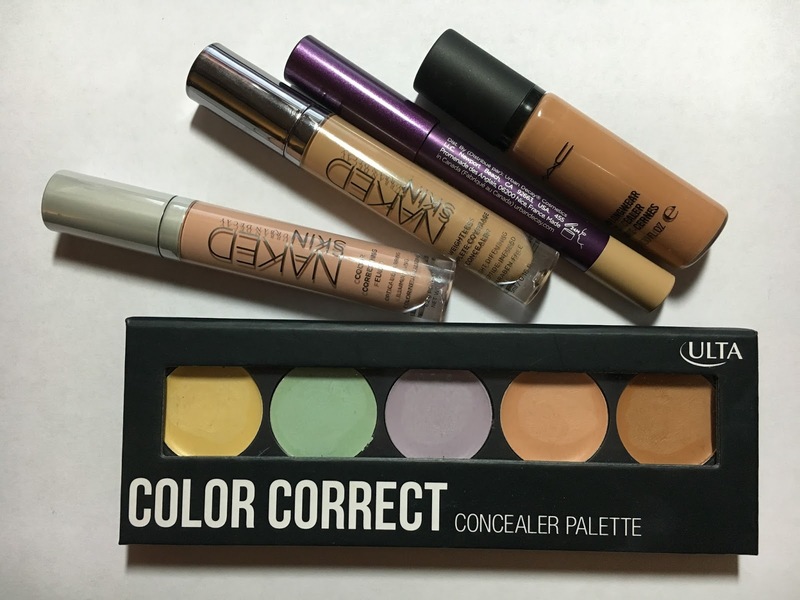 Concealer - Same as with foundation. Note, though, that whatever you're using to blend out undereye concealer needs to be gentle, because undereye skin is sensitive, and the last thing you want to do is aggravate any issues by, I don't know, bursting capillaries or something. 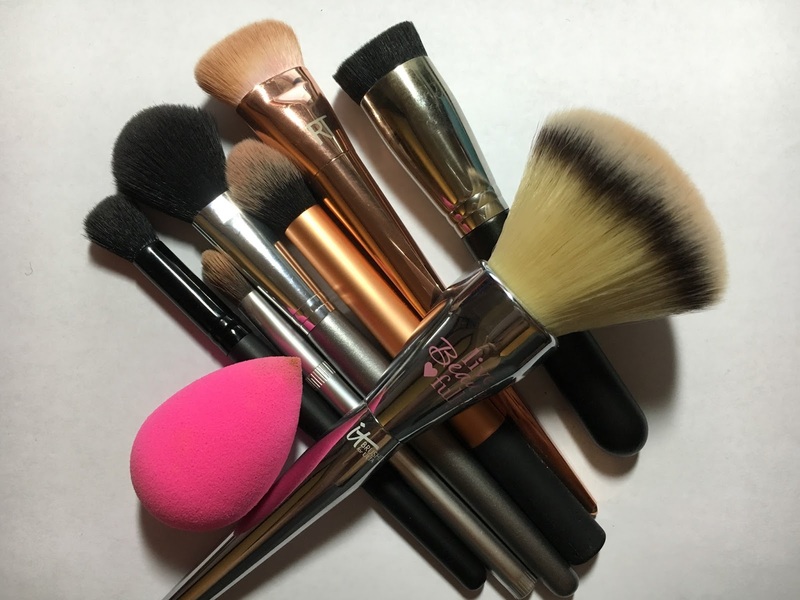 Stuff I have used that I like: Urban Decay Good Karma Blending Brush; ELF Flawless Concealer Brush; and you could also use the sponges above to blend out concealer.